An open house was held Thursday afternoon at the GRTS building trades home located on 337 Woodrow Avenue in Chillicothe. The public was able to walk through the home and ask questions of instructors Don Dennis and Chris Todd. The 3-bedroom ranch-style house is one of many that will be built by Mystic Heights Development along the north side of the old prison property located on Third Street. 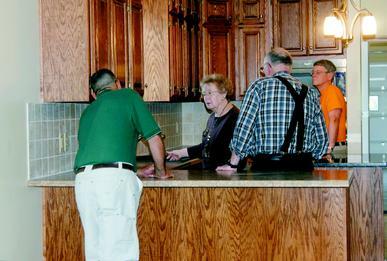 The home's kitchen drew a lot of attention, with its custom-made oak cabinets. 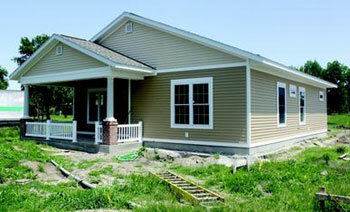 The 2011-12 Grand River Technical School building trades class is inviting the public to an open house event on Thursday, May 17, 2012, from 2 to 7 p.m., at their student-constructed project home, 337 Woodrow Ave., in Chillicothe. The home is a ranch-style structure, with 1,532 square feet of finished living space. A 22-foot by 28-foot, two-car garage is also included with the home. Don Dennis and Chris Todd instruct the GRTS building trades class, which, in cooperation with Mystic Heights Development, built the home over this past school year, as part of their classroom grade. This year's building trades home sports three bedrooms and two full bathrooms. The main living area has an open living/dining room and kitchen. The master bedroom houses a large walk-in closet. The entire home is finished with custom-made oak cabinets, and has a 90-percent gas furnace and air conditioning system. The exterior of the structure is being marketed as "virtually maintenance free," and includes a covering of vinyl siding and soffits, along with vinyl-wrapped, double-hung windows. Exterior doors and garage doors are metal-insulated, and the house, itself, is insulated by a wet-blown cellulose compound. The garage includes a storm room. Out front, the home has a covered 10-foot by 20-foot porch, enclosed by two decorative pillars and a white fence. A 16-foot by 20-foot concrete patio is also included with the structure. The students in this year's building trades class were as follows: Tyler Wagy, Trevor Whitley, Austin Anderson, Branson Askew, Dylan Assel,Chris Ayers, Cody Baker, Riley Blades, Brennen Bonderer, Bryar Bookout, William T. Coats, Cory Collins, Dalton Crackenberger, Derrek Crackenberger, Matthew Denton, Timothy Cole Dodson, Allen Garland, Caleb Graham, Dakota Gray, Preston Ishmael, Austin Hatfield, Logan Kelly, Cody Kromeich, Harrison Lapen, Justin Lightner, Dalton McCracken, Trace Phillips, Quinton Sanson, Charles Summers, Blake Sweet, Kale Thieme, Cody Troxel, and Kyle Whitt. 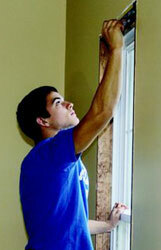 Hale High School student Cody Baker - as part of the Grand River Technical School Building Trades class - worked to paint around the windows on the interior of the Building Trades home on Woodrow Street Thursday morning, February 9, 2012. The class builds a completed home as part of their hands-on learning experience every year. The Building Trades class is working with Mystic Heights Land Development, LLC to build the first of several single family dwellings on the property just north of Third Street and the old prison property. The plan also consists of phases dealing with multifamily buildings, as well. The Grand River Technical School Building Trades classes are doing their part to jump-start what is eventually expected to be a new housing community along the north side of Third Street. Traditionally, the classes build one house per year, as part of their curriculum. For the past two years, the classes have built houses for a specific person, whose highest bid is accepted by the class prior to the build. Before that, they would auction off the finished product (house spec) to the highest bidder. The lack of a bid in an auction three years ago led to the change in procedure. This year, however, procedure changed a little more. Mystic Heights Land Development, LLC, managed locally by Randy Constant and David Buttman, won the bidding war for the 2011-12 class' work, with a bid of $14,176 over cost material, and set the group up as the groundbreakers for a housing structure on the north side of Third Street (and also along and facing Woodrow Street) - the first in a long line of houses expected to be built in the area and of a plan long anticipated in the Chillicothe area. "This is the first year we've built with Mystic Heights," said Building Trades teacher Chris Todd. "We've only been working for a couple weeks." The home that the class is currently constructing was designed by Buttman and is a three bedroom, two bathroom structure, with an open living room / kitchen area, totaling, in all, approximately 1,500 square feet of living space. It also includes an above-ground concrete storm room and a two-car garage. Estimates put the cost of the finished product at $150,000 for potential buyers. Todd, who says that the class has worked with Buttman on the design of the house, making changes where they see fit, believes that, when all is said and done, the vacated area will be filled with a multitude of livable areas, per the map of projected building layouts he's seen. "It shows a lot," he said. According to Chillicothe City Engineer Ron Urton, the total number of houses, duplexes, and townhouses (all of which are expected to be built in the project) - as well as the time frame for the entire building project as a whole - is still unknown. "I don�t think they have that finalized, yet," Urton said. Ground was broken on phase one of the building project back in March of last year. 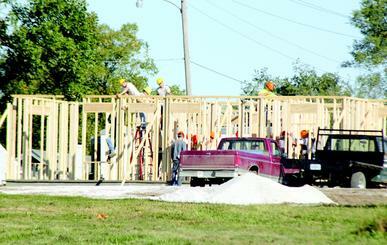 Phase one consists of the building of seven single-family homes. Some will be single story dwellings, while others may have one-and-a-half stories, and some with two-car garages attached to the structure. The Building Trades home is a one-story layout with the two-car garage, and is facing Woodrow Street. Phases two and three of Mystic Heights' project are expected to include the building of multifamily units. Back in December of 2009, the Chillicothe city council approved a plat from Mystic Heights, in which they proposed the building of 100 medium-income housing units along the north side of Third Street. This land was previously owned and utilized by the Missouri Department of Corrections, before the prison was moved north of town. The Building Trades classes, taught by Todd and Donald Dennis, work on the home from approximately 8:30 or 9 a.m. until 10:30 a.m. every weekday morning, and then from 12:30 to 2:30 p.m. every weekday afternoon. "They are glad we're outside," Todd said, of his class. "They were getting restless, doing the class work. They enjoy the fresh air and getting out. That's why they take the class - to get out there and develop some skills."